It began with an onion. No garnish. No frills. It was a singular onion served whole in its own raw skin, with an incision around the top circumference to indicate there is something to be revealed within its cavity. There were dishes served prior to this, and they were executed with no technical flaws, but the chef had yet to surprise us. “A meal should be a slow build-up…to a crescendo,” illustrates the chef. So here with this onion, we had our first real teaser of his creativity and ability. This is the moment of truth. The waiter hints at what's nestled within the onion’s belly--egg, cheese, and truffle shavings--and it sounds pretty ordinary. I popped off the top of the onion to see a fluffy layer of Gruyère and a generous sprinkling of fresh truffles. My spoon found a burst of hot yolk further in, followed by a mouthful that proved the dish to be much more than just an onion. The cheese is airy and light, collapsing into the creamy yolk, flooding my senses with cosy flavours. The truffles do not distract, but add an extra dimension to the experience. The onion itself suddenly becomes very attractive too, once the eater realizes its smooth sweetness that warms the mouth, rather than arriving to bites of pungency. I find myself pulling apart the vessel to eat it as well. Meanwhile, the young and meticulous waitstaff have set down three more dishes. 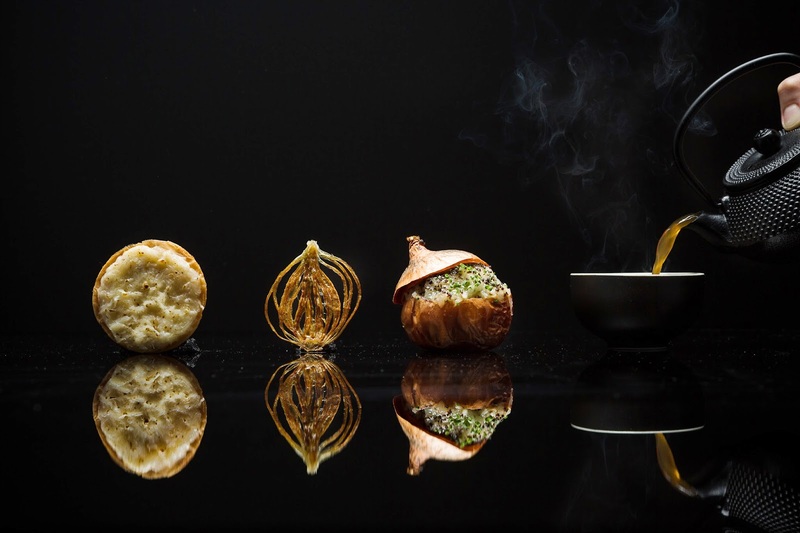 This course is degustation of onions: a dehydrated sliver of onion, a coin sized onion confit and Parmesan spread over crisp phyllo pastry, and finally, a foamy white onion broth drizzled with onion tea. The broth especially is silky and sweet, punctured by earthy undertones. I don’t think I’ve consumed so many onions over one sitting in my life before. I don’t think I’ve written so much about onions before this, either. The menu reads something not quite like a menu, and more like Letterman’s Top 10 List: “Interpretation of My Favourite Vegetables: Oignon doux des Cevennes”, “Cocoa Pebbles: Alpaco, Mandarin, Shimeiji”, and so on. Such vague listings seem to be the trend these days. For the first time visitor, it is difficult to know what to expect, but the chef proves to be adept at surprises. The restaurant describes its cuisine as “gastro-botanical”, using natural seasonal ingredients often inspired by the Botanic Gardens surroundings. Most of the documentation on the Malayan Peninsula’s floral life was discovered and written right in Singapore’s Botanic Gardens during World War II. As you might recall from your primary school history teachings, Eldred John Henry Corner (E.J.H. Corner), an English botanist and mycologist (he was a fun-gi!) resided in the Botanic Gardens with his pet monkeys, documenting what we know today about tropical fungi, trees, fruits, and even ginger and pandan. The Botanic Gardens is currently a candidate for UNESCO World Heritage status. The 1910 black-and-white bungalow where The Corner House is located, was formerly the Les Amis restaurant, Au Jardin, until early this year. The Corner House is no less romantic than its former, though white tablecloths have been tossed away in favour of more contemporary furniture designs. Co-owners Singaporean chef Jason Tan and wine merchant Renny Heng have worked together with E.J.H Corner’s only son to preserve the botanist’s work and memories—his intricate artwork of Singapore’s faun and flora hang on the walls of the two storey bungalow, as well as black & white photos from times past when E.J.H was still alive. There’s much to be appreciated in the history of the structure, marvellously paired with Chef Jason Tan’s fresh and beautiful interpretation of his “gastro-botanical” cuisine. Which food bloggers do you not trust?